At a recent talk on the GST, I asked those present what they thought “GST” stood for. Most of those present responded, “Goods and Services Tax”. Then, I showed them a cartoon by Zunar which described GST as “Golfing, Shopping, Travelling”! They got the joke and laughed knowingly. But humour aside, the concern over the impending Goods and Services Tax was evident on the faces of those who attended the talk at the Church of the Risen Christ in Air Itam, Penang. The first thing to note is that the GST is a regressive tax. It is a significant move away from the somewhat progressive tax system that we used to have. Why is it regressive? It shifts the burden of tax away from the rich to everyone, including the vast majority who are struggling to make ends meet. And instead of a consumption tax imposed on certain items, this time only few items are exempted. What people need to watch out for is actually how much the GST collection will exceed the expected projected amount – THAT actually represents the inefficiency of the govt. The more successful GST is, the more it shows how badly BN govt really has been in performance in collecting taxes. My neighbor said GST to him was Government Sangat Teruk upon realising that his purchasing power would be eroded 6% along with GST and shrinking Ringgit. We must understand that Zonar is a Pakatoon sycophant. Anything that is a first will cause some anxiousness but In 6-9 months time everything will be back to normal. GST has been implemented in more than 170 countries out of 200 countries in the world and it did wonder to their economy. In SE Asian the Philippine, Indonesia, Singapore, Vietnam & Thailand also implement GST and is moving forward. Myanmar may not have GST but its a … not among the in the world but also among countries of SE Asia. Lets move forward. GST is the way . “Anything that is a first will cause some anxiousness but In 6-9 months time everything will be back to normal”. 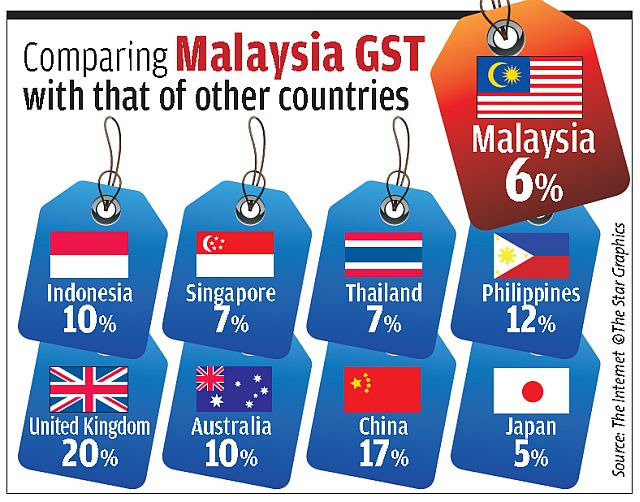 Kenapa tak ikut Singapura, mula GST dengan 3%? 6% terlampau tinggi untuk golongan miskin! GST = Government Siap Tumbang?